Earlier this week, Netflix subscribers all over the country got some bad news when it was announced that the streaming service would soon be losing a huge chunk of its British TV series lineup, including Doctor Who and The Office. It turns out that wasn’t entirely true, and Netflix has confirmed those early reports were partly in error. Let’s all pour ourselves a (sonic) screwdriver in celebration. Here are the series that will still be around after the renewal update happens at the end of the month. Netflix additionally confirmed with Variety that the deal excising certain U.K. series doesn’t include the shows Sherlock, The Honorable Woman, Happy Valley and Call the Midwife, so none of these were ever in any danger of getting removed to begin with. That’s good news, but probably means we’ll have to hear about their renewal arguments whenever they come up, though Maggie Gyllenhaal’s recent Golden Globe win for The Honorable Woman should cement that series on the site for a long time. For everyone wondering about the rest of the earlier report’s entries that aren’t listed in above, there’s only bad news. 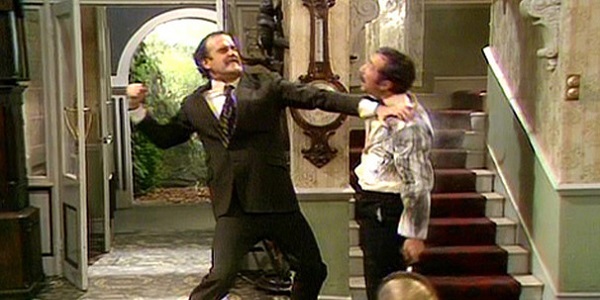 Sadly, February 1 will bring the departure of MI-5, Red Dwarf, Black Adder and Fawlty Towers (among others). The latter three are among the greatest comedies in TV history, which makes this all the more disappointing. In the meantime, make sure and binge-watch the hell out of them while you still can. Any comedically violent behavior that happens in February as a result of streamer rage is perfectly acceptable. If this proves anything, it’s that not even Netflix’s future schedule is free from rumor-mongering misinformation, and that people are almost always just two seconds away from flipping out over what they might not be able to watch anymore. I can’t tell you how many times I’ve gone to Netflix to watch a show that I know was there at some other point, only to find I’m always too late. Absence makes the heart grow fonder…for Hulu Plus and Amazon Instant.